Feb. 11, 2015, 2:39 p.m.
By Joseph Lichterman @ylichterman Feb. 11, 2015, 2:39 p.m. 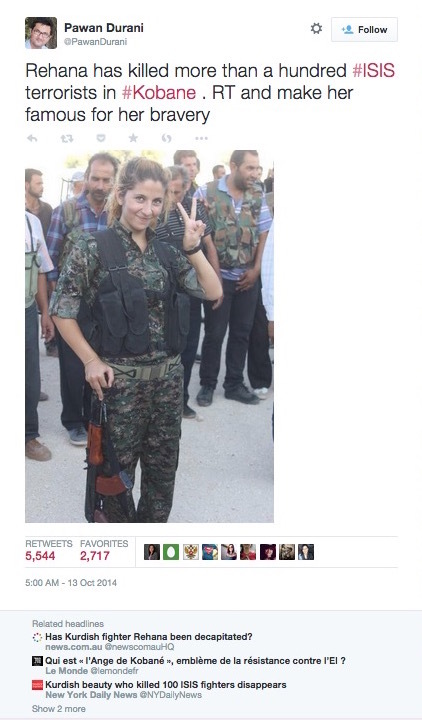 The rumors began with a single tweet last October: A Twitter user in India posted an image of a Kurdish fighter, Rehana, he claimed had killed more than 100 ISIS fighters. Soon news outlets around the world, using the information in the tweet, began reporting on the woman’s alleged feats. In response to those stories, ISIS then claimed that it had beheaded the woman, producing a photo of the allegedly beheaded woman. This spurred another round of stories based on ISIS’ claims. But did any of this actually happen? She volunteered to defend Kobani against the Islamic State and risk her life. It’s an affront to her that some people think that’s not enough, but that more fantastic details have to be invented, and it also devalues the very many completely true and even more fantastic stories coming out of Kobani. Unfortunately, there’s not an iconic picture for every fantastic story, and vice versa. This story was told by Craig Silverman, a fellow at Columbia’s Tow Center, last night at the release of his new study on how news sites spread and debunk viral rumors online. Silverman gave an overview of the paper, “Lies, Damn Lies and Viral Content,” and moderated a panel with Gawker editor-in-chief Max Read, Digg managing editor Anna Dubenko, and Fusion social media director Margarita Noriega. As part of his research, Silverman founded Emergent.info, a website that catalogs and tracks rumors. The site was launched last September, and Silverman used stories that were tracked through the fall to inform his research. While the whole 164-page report is worth reading, here are few of Silverman’s key findings and suggestions for how news organizations can avoid spreading false rumors. Many news organizations take few steps to actually verify this sort of viral story that they often publish, Silverman found, noting that outlets will start a chain of linking to and citing others who have already reported the rumor. “The story’s point of origin, once traced back through the chain of links, is often something posted on social media or a thinly sourced claim from a person or entity,” he wrote. This makes journalists prime targets for hoaxes, as these types of stories often spread like wildfire on social media, especially Facebook, and the continued reporting from the media helps give credibility to the rumors even if they’re false, he said. This extends to how news outlets present these viral stories as well. 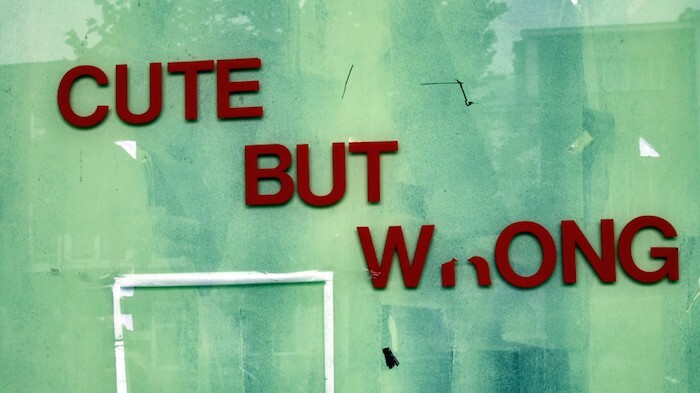 They’ll write their headlines and stories in ways that signal that the information isn’t verified by using words like reportedly or claimed or by ending a headline with a question mark. Even with these precautions, Silverman says this still conditions the reader to believe that the information in the story is true. To rectify this, he suggested that news organizations try to stick to use the same words to consistently hedge stories, so readers know what to expect when an outlet doesn’t have all the information verified. While the spread of viral rumors may seem like a blemish on the online news industry, Silverman did point out ways outlets can effectively debunk stories while still having fun and maintaining some of the traffic that comes from popular viral stories. 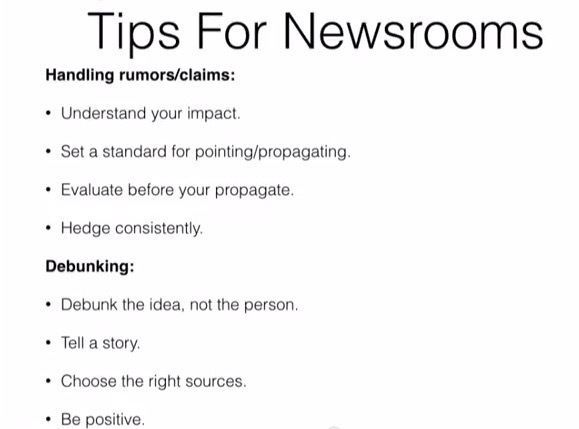 Basically so far, all of @craigsilverman findings about news and rumor are depressing. We’re doomed. In his talk, Silverman used the example of a rumor that popped up last fall: Durex was making pumpkin spice-flavored condoms. 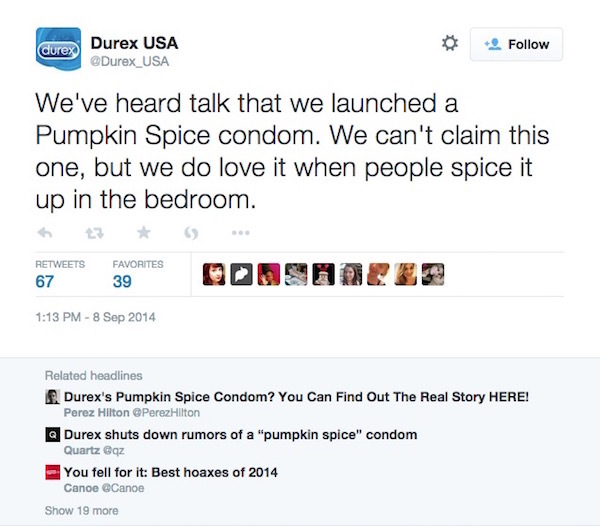 Durex quickly said the rumor wasn’t true, but that didn’t stop the story from taking off. After the story was debunked, Silverman said no outlets published stories claiming the condoms were real, and publications were then able to have a little fun with the story by running stories on other condom flavors they wished existed. Still, Silverman cautioned that news outlets needed to be careful with how they debunk rumors, especially for more serious stories, because any reporting on it can help the story take off, even if the outlet is trying to say it’s false. Photo by Gerard Stolk used under a Creative Commons license. POSTED Feb. 11, 2015, 2:39 p.m.
Lichterman, Joseph. "A new Tow Center report looks at how news outlets help spread (or debunk) false rumors online." Nieman Journalism Lab. Nieman Foundation for Journalism at Harvard, 11 Feb. 2015. Web. 20 Apr. 2019. Lichterman, Joseph. "A new Tow Center report looks at how news outlets help spread (or debunk) false rumors online." Nieman Journalism Lab. Last modified February 11, 2015. Accessed April 20, 2019. https://www.niemanlab.org/2015/02/a-new-tow-center-report-looks-at-how-news-outlets-help-spread-or-debunk-false-rumors-online/.